As the price of higher education in the United States continues to skyrocket, student loans have become commonplace for college students looking to cover high tuition costs. Students who cannot cover tuition and fees with federal loans alone typically turn to private student loans to bridge the gap. Since private student loan eligibility is dependent on creditworthiness, students must often also ask parents, family members, or other trusted adults to cosign on their student loans. According to our data, about 90% of all private education loans are cosigned. Students need cosigners, which are also called guarantors, when they do not have strong enough credit or little-to-no income. Cosigners with strong credit and reliable sources of income help students get approved for loans, and may even help them qualify for lower student loan interest rates. Typically, a cosigner on a student loan is a parent, grandparent, or guardian. All parents want to send their children to college, and affordability is often a second thought. When presented with the option to cosign on a student loan, most parents will assume the responsibility without hesitation. However, cosigners do take on quite a bit of risk and financial liability when doing so. Here at LendEDU, we discovered that many parents are not only hurting their financial health by cosigning, but also second guessing the decision to help their child. Earlier this month, we conducted a survey to 500 parents, all of whom are currently acting as cosigners on their children’s private student loans. Our goal was to test parents on their knowledge of the risks of acting as cosigner. 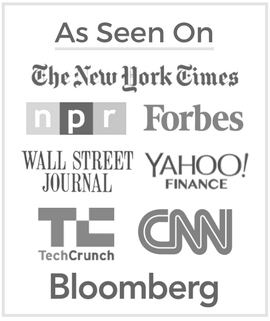 And, we wanted to understand the long term financial impact of cosigning. 1. Knowing what you know now, do you believe that you fully understood the risks of cosigning on a private student loan when you initially agreed? 33.20% of cosigners did not fully understand the risks of ﻿cosigning﻿ when they initially agreed. 2. Do you believe that your credit score has been negatively ﻿impacted﻿ by ﻿cosigning﻿ on a private student loan? 56.80% of cosigners believe that their credit scores have been negatively impacted by cosigning on private student loans. 3. Has your child made a late payment on the cosigned loan? 34.40% of cosigners’ children have made a late payment the cosigned loans. 4. Do you feel like your child’s student debt is putting your retirement in jeopardy? 51.20% of cosigners felt that their children’s student debt is putting their retirement in jeopardy. 5. Has your child asked you to help them make monthly payments on the loan? 58.40% of cosigners answered that their children have asked them for help making monthly payments. 6. Have you helped your child make monthly payments on the loan? 65.80% of cosigners have helped their children make monthly payments. 7. Do you regret making the decision to cosign on a private student loan? 35% of cosigners regret making the decision to cosign on a private student loan. 8. Have you or your child tried asking the private student loan lender for cosigner release? 69.80% of cosigners have not asked or have not had their children ask their lender for a cosigner release. 9. Has your child considered refinancing the student debt as a way to release you as a cosigner? 59.40% of cosigners reported their children have not considered refinancing their student debt. 10. Has your child made late payments which have negatively impacted your credit score? 35.80% of cosigners have had their children make late payments which negatively impacted their credit scores. 11. If you could do it again, would you still cosign on the student debt for your child? 34% of cosigners said they would not cosign on their children’s student loans if they could do it again. 12. Did you consider using Parent PLUS loans as an alternative funding method before you agreed to act as a cosigner? 45% of cosigners did not consider PLUS loans as an alternative funding method. 13. Has cosigning hurt your ability to qualify for a mortgage, auto loan, or other type of financing? 34.40% of cosigners said cosigning has hurt their ability to qualify for mortgages, auto loans, or other types of financing. Too often, parents make the hasty decision to become a cosigner without fully understanding the risks. Our first question was as follows: “Knowing what you know now, do you believe that you fully understood the risks of cosigning on a private student loan when you initially agreed?” A third of parents (33.20%) answered that they did not fully understand the financial risk of acting as a cosigner. Considering the long term financial liability that comes with cosigning on a student loan, a third of parents answering “no” is quite concerning. One of the biggest gambles that parents take when they cosign is the possibility that their credit score will be negatively affected. If payments are missed or late, the guarantor is responsible, and his or her credit score will take a hit. According to our survey, 34.40% of cosigners said their children have made a late payment on a cosigned loan. This poll question indicates that at least a third of parents’ credit scores may have been negatively affected by late payments, but it turns out that the number is actually higher. LendEDU posed the following question: “Do you believe that your credit score has been negatively impacted by cosigning on a private student loan?” A startling 56.80% of cosigners said that they do believe their credit score is being negatively impacted. Having their credit score adversely affected is not the only risk guarantors are subjecting themselves to. If the student is unable to repay the loan, the cosigner is forced to assume full responsibility for repayment. Furthermore, the lenders have no responsibility to keep cosigners informed on the status of loans. With this in mind, students could miss payments without the accountable guarantors even knowing until they see the marks on their credit statements. Parents may think that by cosigning they are acting as a safety net in case their child cannot repay the loan. In reality, however, the parent and child are equal partners in repaying the loan. Not only do parents not understand the risks of cosigning on a student loan, they also do not understand what different student loan options are available. One of the primary alternatives to cosigning is to take out a PLUS loan which can be used to fund a child’s education. A PLUS loan is a federal student loan that the parent is solely responsible for. When asked if they considered PLUS loans, 45% of respondents said they did not. Refinancing student loans may also be a beneficial consideration. This is the process of a third-party lender paying off the previous loan and offering a new loan to the borrower. The new loan normally has a lower interest rate, which leads to savings. Parents can be released as cosigners on private loans if their children refinance with private lenders (this cannot be done through the federal government). LendEDU asked the following: “Has your child considered refinancing the student debt as a way to release you as a cosigner?” 59.40% of our cosigner respondents said that option had not been considered. One final option for parents looking to get out of cosigner obligations is to simply ask the private lender for a cosigner release. Lenders may present a cosigner release option if a borrower makes on-time payments for a certain period and is deemed creditworthy. If granted, the parent is no longer a cosigner and thus no longer responsible for the loan. 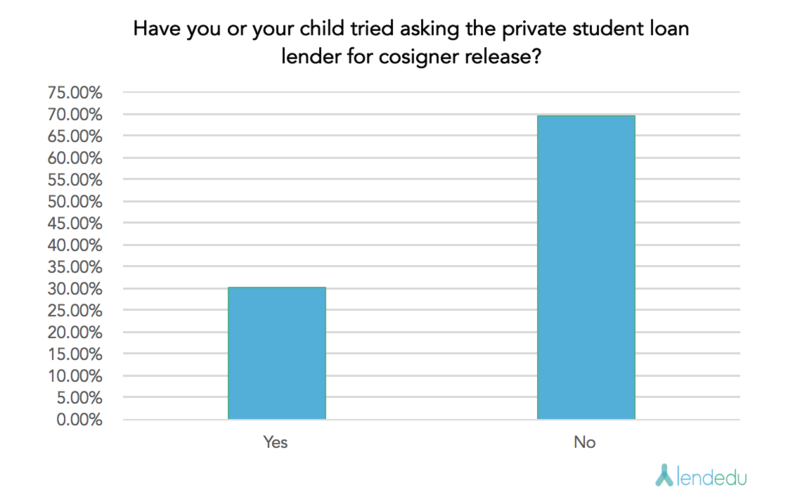 69.80% of our respondents said that their children had not asked the private student loan lender for cosigner release. Parents agree to cosign in order to help their children pay for college; without that help, many students wouldn’t be able to attend college. Many parents look at cosigning as essential. After all, a degree opens doors to higher pay and better career options. However, while new graduates can benefit from a diploma, parents will be the ones hurting down the road. We already discussed how cosigning can damage credit scores, but there are additional negative financial impacts to consider. 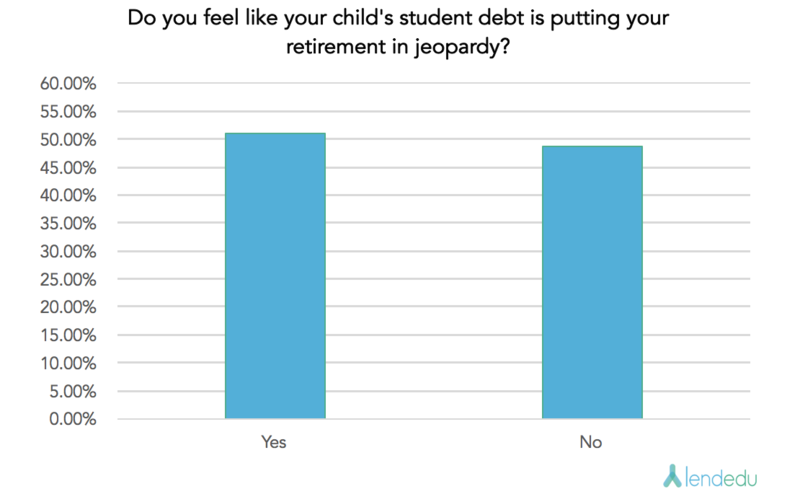 LendEDU asked cosigning parents to answer the following question: “Do you feel like your child’s student debt is putting your retirement in jeopardy?” The responses we received from this question were quite unsettling. More than half, or 51.20%, of respondents said that cosigning has put their retirement in jeopardy. Many parents rely heavily on their retirement savings after their working careers have ended. With more than 90% of private student loans being cosigned, it is very possible that this generation of parents have or will have to put off retirement in order to mitigate the losses brought on by cosigning their children’s student loans. Becoming a guarantor hurts the credit scores and retirement funds of parents, but that is not all. LendEDU asked, “Has cosigning hurt your ability to qualify for a mortgage, auto loan, or other type of financing?” More than a third, or 34.40%, of those polled said that cosigning has indeed hurt their ability to qualify for financing. The impact of rising education costs, paired with the dependency on cosigning, is impacting other financial services and industries. Parents need to seriously mull over the decision to become a cosigner on their child’s student loans. If they are not diligent, parents will surely feel the negative and lasting financial effects. The team at LendEDU thought it would interesting to gauge the level of regret that parents may feel for cosigning a student loan. Ideally, they will be able to see their sons and daughters graduate college. How could you possibly regret anything you did to make that happen? As it turns out, a large proportion of parents said that they regret becoming a cosigner on their child’s student loans. Our question was simple and asked the following: “Do you regret making the decision to cosign on a private student loan?” Among the 500 parents who are currently cosigners, 35% of them said that they do regret the decision. Although not a majority, more than a third saying that they regret the decision to cosign is quite the eye-opener when you consider the importance of graduating from college. In mid-February, we conducted this survey to 500 parents, all of whom are currently acting as a cosigner on their child’s private student loan. The survey was conducted via the online survey provider, Pollfish. Respondents varied in age and location throughout the United States. A screening question was asked to ensure that respondents were actually currently acting as cosigners on private student loans.